The guiding principle to a peaceful life, in this fast-moving world is the proper interrelation of your body and your mind, with the environment. Deadlines and workload leave you exhausted and stressed, both mentally and physically. The answer lies in a proper routine, wherein you are getting your nutrients, a good night’s sleep, a proper workout and some time to rest and quiet your mind. Breathing is the most important activity of our body. You don’t need a 100$ spa treatment to calm your mind and body, a 10 minute breathing exercise can help you de-stress. There are a variety of breathing techniques which will help you restore balance to your body and soul. When you are silent, through the breaths you leave, your mind frees you of disturbing thoughts, old fears, and the fresh breaths you take in heal your soul. 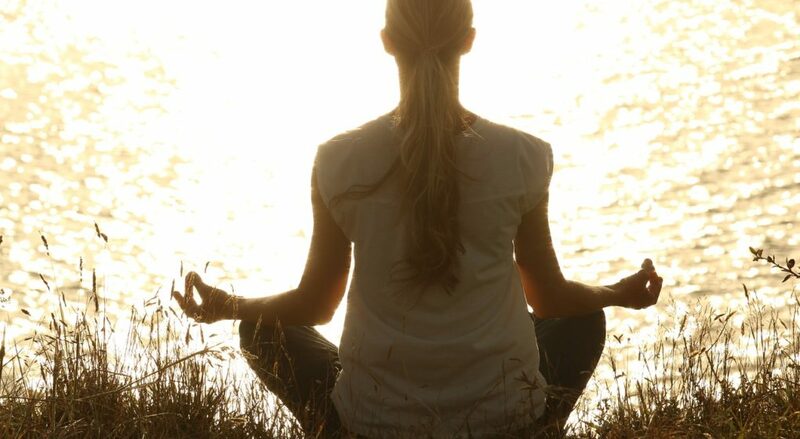 Meditation keeps you aware and sharp, also increasing the blood flow, reducing muscle tension, and increases serotin levels which improves mood and behavior. You’ll be surprised by the ideas you get during meditation. In fact, most people find this – along with taking a shower – to be their most creative times of the day. Next to breathing, the second most vital function is to eat and drink. Have a proper diet that includes the major macronutrients and a combination of the major food groups. Make sure you have a healthy breakfast in the morning around 7-8 AM, including a glass of milk. You can start your day with a glass of water (that is right after you wake up). It fires your metabolism, keeps you hydrated for the rest of the day, and flushes out toxins from your body. Avoid excess caffeine in stressful situations, making things worse with processed foods and alcohol. Early to bed, early to rise. Well, not much to argue here. Restful sleep (at least 7 hours of healthy sleep) keeps you fresh for the whole day. When you haven’t slept properly the previous night, you tend to have problems trying to concentrate on your work- your mind is tired and your face looks unenthusiastic. If you can’t commit to consistent sleep pattern, you disrupt your body’s natural balance with nature, leading to the weakening your immune system, irregular weight gain or weight gain, and maybe depression. While we are spending hours wearing stiff clothes, and sitting behind uncomfortable desks, our bodies are developing chronic back pain, and increasing the cholesterol levels. Our body needs movement. Find an aerobic activity, or maybe go for a simple walk. Regular physical activity keeps your body flexible, and increases stamina, making it easier for you to adapt to tough conditions. Exercise can reverse the detrimental effects of stress and lift depression. Other than these 4 basic things, make sure you keep a good company. People who encourage you to take challenges, those who push you out of your comfort zone are the ones whom you need in your life. Your friends should be the ones who support in tough times, and have a laugh along with you in your good times. Cultivate loving relationships. If both work and your loved ones stress you out, you are not on the right road. Also make sure you don’t hold on to your feelings. Let it out, or else it will build up in a poison ruining your health completely.